everything LEB: Need your help! Speaking of disasters, I am about to publicly shame the BF to finally let me makeover his office! Please no mean comments here...I understand it is his space and he can do what he likes with it. My issue is that it is directly off of the family room and when I sit on the couch at night it is in my direct line of view. Not to mention that every person that should step foot in our apartment has to look at this as soon as they walk in...not my idea of a warm welcome. So...this is where you all come in. PLEASE (I'm begging here) leave him a comment telling him to just let me at it already. I promise it will be masculine, organized, fit for an MBA grad, and most importantly fit for the best BF ever! 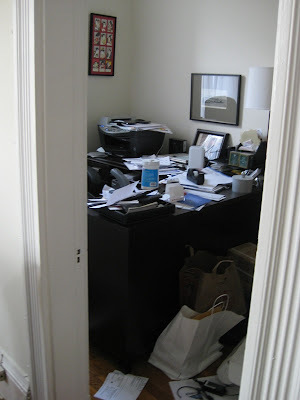 ok bf ... time to let gf organize your office for you. yup, she's really great at this organizing thing and i have a sneaky feeling you'll love what she does and somehow be more productive. PLUS when the gf is happy the bf is happy and organization makes us woman very happy. Dude - just give up and let her at it. You'll feel much better - trust us. Or else. Ok, I totally know how you feel. My husband will NOT let me design his office/man cave. Here I am, with an interior design degree, and he will NOT trust me! Dude, let her take the wheel! Oh linds it is bad! Ok BF you must give in and let Linds do what she wants. I swear she will still make it manly and organzied and then she will stop bugging you about it. Hmmm whatelse how about just pretty, pretty please and if you let Linds to do I'll send over a batch of my famous brownies! Let her at it. No doubt it will end up stylish yet masculine in the end. pretty bad. some organization is crucial!! OMG - that room needs serious help!!! Don't you know if the girlfriend is happy, everyone is happy? Plus, that office is sad!!! ha, ha, that's awesome. If I didn't have a neat freak husband I could totally let my office (if I had one) get like this, except it would be fabric instead of paper. Let your very decorativaly talented girlfriend into your office! She's probably running out of rooms to decorative anyway. Mr. BF You are one lucky man to have a GF who WANTS to clean your office and make it amazing for you!!! Oh no! The possibilities here are endless. Just THINK of how much time will be saved when everything is neat and organized. Let her at it! I am sure you will not be disappointed! I agree with everyone else. 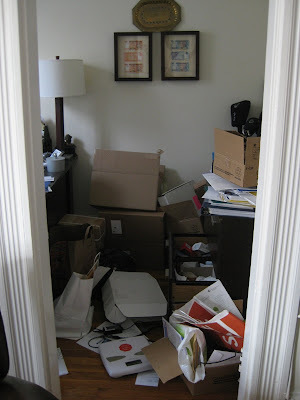 Let the professional organize the room, which once completed, will save you time and energy. 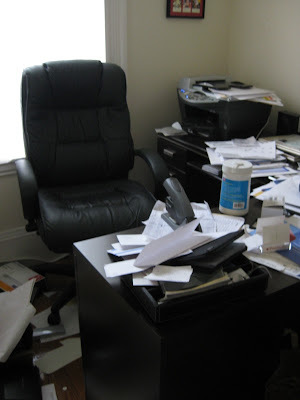 I completely agree that clutter = stress. If Linds is anything like me, just seeing that room would stress me out, every single night. She's a professional and she loves you, she will make it awesome. How old is this guy? That's the office of a 19 year old, not an adult with a successful career. Men's spaces can be very manyly but at the same time put together. Your GF has great taste and will not do you wrong! Please give this man plenty of vertical storage. Lots and lots of vertical storage. I've actually seen worse, but he needs help.